If Palmer's comes out with one more variation of cocoa butter I am going to SCREAM. Well maybe not, because I think they have another winner on their hands. 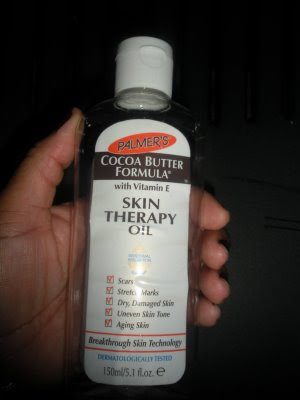 The Cocoa butter Skin Therapy oil is different from the palmers Cocoa butter oil..lol They have a similar scent and the consistency is almost identical but a difference does exist. The Skin Therapy oil is supposed to have some new breakthrough skin technology which makes it effective in improving the appearance of scars, uneven skin tone, aging skin, stretch marks, dry/damaged skin and scars. I used this oil on a scar and I think it really has made the scar less visible. I have been using it consistently for about3 weeks and the skin in that area looks smoother and it looks like the uneven skin tone is being addressed as well. I think this product helped to transform my skin much better than if I had not been using it. It is recommended that you apply this product 3 times a day. I have to tell you that the ingredients look pretty normal, cocoa oil, vitamin e etc., but for some reason this product does the trick. I would certainly buy this product again, it was close to $9.00. (lost the receipt). I really need to examine the ingredients list of this product and compare it to the ingredients on the Palmers Body oil because they seem so similar but the Skin Therapy version packs a punch. Have you had success with this product? Making the Band- Que, Que, Que what is wrong my dear? Poor thing, I feel like I am watching the demise of Que. Did you watch last night? I know he is an artist and this "fame" is new to all of them but maybe the pressure is just too much. Housewives- I said I would not be watching the Housewives of NYC since my enjoyment came from watching the Housewives of Atlanta. Nevertheless, I was sucked into the show for totally different reasons. These ladies are bonkers and funny to watch but what's up with the former model who had a battle of the words with Bethany? The things people value- just makes you go hummmmmm (Arsenio Hall used to say that-fyi). I'll look out for this other oil from Palmer's, however I think I found a keeper with the gel oil. Re: Making the Band, I can't believe Que is flipping out like that. He knew he was making Brian late and then for him to flip like that???? And the way he turned on the manager was totally uncalled for. I know I wasn't the only one thinking Que was losing it big time. Since last couple of weeks he has been acting like an "alien" according to Will. LOL. But yes I hope he has not messed up his life with this nonsense, and Robert reminded him they "were not Danity Kane". But did you peep how he was stepping to Screwface. No respect. Bethany is my chick and Mrs. Ex Ben Simone better watch it. She comes off like her stuff don't stink, ewwwww take that somewhere else. But I noticed that the other ladies were picking up for Bethany because they knew what the deal was. Avarts Poor Que well I guess he will get it together because I see that he's still with the group. I've already picked up a bottle of this Skin Therapy Oil but I have to admit that I'm not to crazy about the smell (I hate chocolate maybe that's why! lol) However, I don't mind using something that will work and get the marks I''d want to fade QUICKLY before the summer comes. THANKS for this beauty secret! lol I will tell you if it works in a month ok girl! Just Wondering I hope it works for you and I can't wait to hear about your progress.